The voice of Canada's mountain community. Established in 1906, the Alpine Club of Canada is a registered charity, and the country's longest-running outdoor club. The club is made up of 22 local sections from coast to coast and maintains the largest network of backcountry huts in North America. With deep roots in alpine exploration, environmentalism, mountain culture and inclusivity, the club provides the means for all mountain lovers from across the country to take to the hills. We encourage our members to live a life of outdoor learning, to practice safe mountain travel, and to continue the traditions of exploration and advocacy for Canada's incredible mountain environments. The Alpine Club of Canada is guided by the following vision, mission and values statements. These represent the principles and beliefs of the ACC, going back over 100 years. These statements were formally adopted in December of 2014 and updated in 2016. To bring together, and give voice to, Canada’s mountaineering community. The Alpine Club of Canada promotes alpine experiences, knowledge and culture; responsible access; and excellence in mountain skills and leadership. With 16,000 members in 22 sections across the country, the ACC has no shortage of stories to tell! Many of the stories you'll read on Aspects are submissions from our members, ambassadors, staff and volunteers. Are you interested in contributing? Please click on the link below for more about how to submit your story for consideration. Keith Haberl has been the ACC’s Marketing Manager since 2012. He authored the first guidebook to the ACC huts in 1995 and today oversees all club publications and messaging. He is a lifelong climber, improving skier and proud introvert. He believes in the importance of accuracy and precision as well as hyperbole in language and likes to quote authors he’s never read and musicians he doesn’t actually listen to. He’s comfortable with all of his contradictions. Contact Keith. Kristy Davison is a photographer, designer and writer from Canmore, AB. Kristy took on a communications role with the ACC in 2017 helping to develop and streamline our web and print publications and social media. 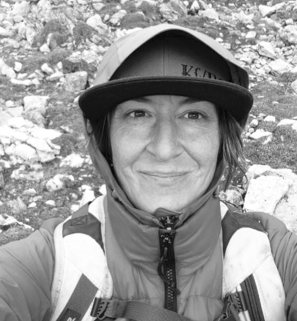 She completed a photography degree at ACAD and a web design diploma at Mount Royal University before becoming the founding publisher, editor-in-chief, and photo editor at Highline Magazine in 2008. Contact Kristy. ENHANCE our capacity to meet member needs, engage more volunteers, strengthen membership stability and reach out to our youth. ADVANCE our financial sustainability to ensure we have the means to expand our facilities and programs. EXPAND networks and communications to build public awareness and support membership growth. IMPROVE how we do things and how we work together. Affirm the intrinsic value of mountain regions and mountain sports to the human spirit. Willingly share our knowledge of the mountain environment and recreational best practices with others. Endeavour to conduct ourselves safely in the mountain environment at all times. Have a responsibility to continue to increase our knowledge of the alpine environment, and to minimize our impact upon it. Recognize that personal fulfillment in the outdoors has diverse expressions, but a common foundation in personal responsibility. Are mindful and respectful of our history and legacy.